A home garage workshop is a great place to work on hobbies, home-improvement projects or even run a business. It doesn’t take a lot of room or cash to set up a sweet space you can call your own. A good workshop has certain essential features: security, space, lighting and organization. Garages, whether they have a workshop or not, contain lots of valuable items. Install motion activated lights outside the door. Make sure your garage door is sturdy. Steel-reinforced doors are some of the strongest. Consider upgrading the opener to a “smart” system. These openers allow you to monitor the door via your smartphone, tablet or computer. You’ll get alerts if the door opens. You might not have much space to play with. If you plan on working while your cars are parked, a space of 6 feet deep is about the minimum. That’s enough room for a bench, stool and room to maneuver. Your work bench should be solid. A standard premade bench is about 2-feet deep. If you’re inclined, you can build a strong, simple bench yourself. You’ll also want a stool or a cushioned mat for standing. Workshops need good overall lighting and appropriate task lighting. Fluorescent lights hung from the ceiling are a good choice for both purposes. Make sure one of the lamps is installed directly over the workbench. For more flexibility, get a gooseneck light that clamps on the bench. Halogen or LED bulbs are good choices for task lighting. Assess lighting power by comparing lumens in light bulbs. You’ll need about 150 lumens per square foot of space. Good storage is key to a workshop. 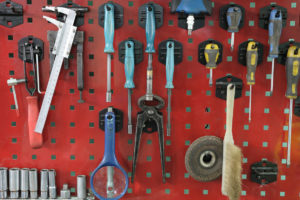 Without it, your workbench will be covered in tools and supplies. Think about the organization of your tools. Place frequently used tools within easy reach. 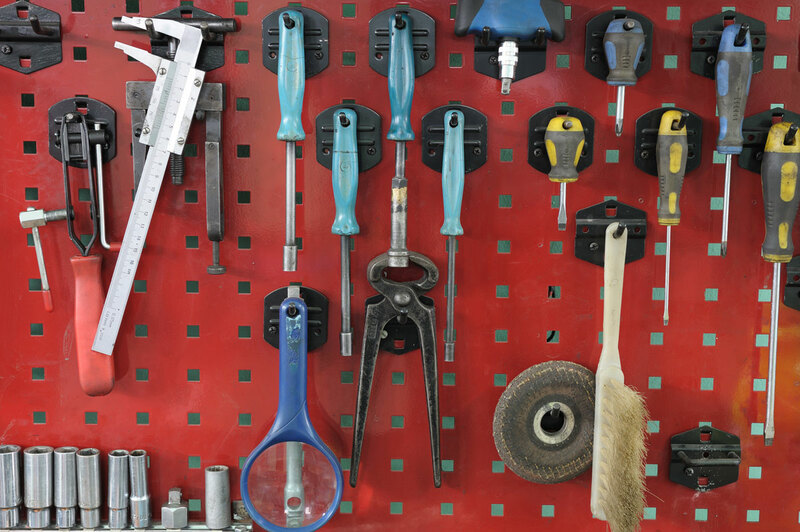 A pegboard is the classic way to hang lots of small items. For less frequently used supplies, bins or shelves under the bench are great. Shelves hung overhead are also effective. Customizable modular storage gives you flexibility and lots of places for your stash. If your home is older, you may need to upgrade the electricals. A dedicated electrical panel is a worthwhile investment if you’ll be plugging in appliances or using power-hungry tools. Installing an AC unit can make the garage tolerable during the height of summer. If your space lacks windows, consider installing one or two. There’s really no end to the upgrades you can make. Ponderosa Garages can help keep your garage door and automatic opener secure and well maintained. Give us a call for a free estimate.